The residential market has seen vast improvements in the past two years with values approaching levels experienced prior to the economic downturn. Specifically, the market for waterfront residential properties has appreciated steadily with continued improvement expected. 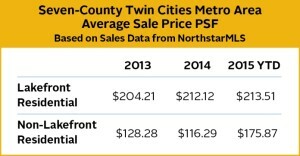 Waterfront properties in the Twin Cities market are highly sought-after and command strong sale prices because of limited supply and attractive amenities. Today, there is pent-up demand for lakefront properties due to low inventory during the past few years as a result of the recent recession. 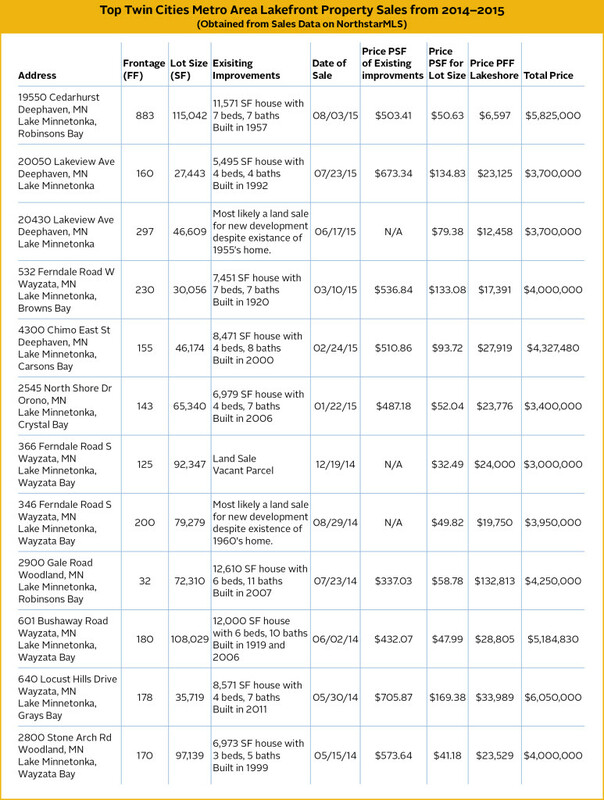 As a result, desirable lakefront properties are going under contract at a rapid pace. •	Quality of any existing improvements. However, depending on the quality of the lake, location on the lake, amount of frontage, and other factors, existing improvements might not add contributory value. Therefore, in waterfront property appraisals it is critical to examine the local market, the relevant neighborhood, and the specific property to determine if the valuation includes existing improvements or if it is strictly a land appraisal. 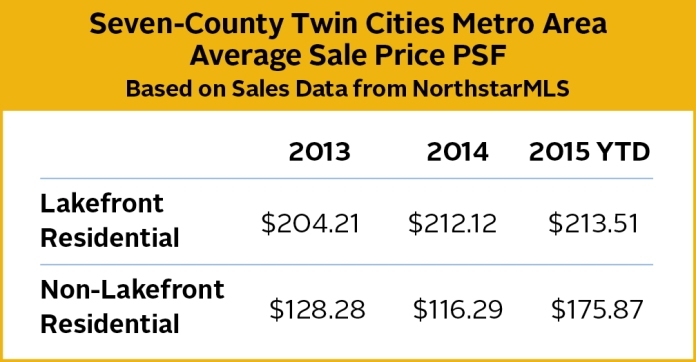 Based on 2015 year-to-date sales data from NorthstarMLS the average sale price per square foot for all lakefront residential properties in the seven-county metro area, was $213.51 per square foot. For the same time period, the average sale price per square foot for non-lakefront residential properties was $175.87 per square foot. To illustrate the market improvement, in 2014, the average sale price per square foot for all lakefront residential properties sold was $212.12 per square foot. In comparison, the average 2014 sale price per square foot for non-lakefront residential properties was $116.29 per square foot. In 2013, the average sale price per square foot for all lakefront residential properties was $204.21 per square foot while the average 2013 sale price per square foot for non-lakefront residential properties was $128.28 per square foot. Although the residential market as a whole has greatly improved, because lakefront property usually trades in a higher price bracket than standard homes, it is slightly behind on recovery but expected to catch up quickly. Although the sales noted above set the upper bracket of residential sales in the state, they are a good indication that the residential lakeshore market as a whole is very much on its way to full recovery.